18th C, Northern Elm, Shanxi. Technique of ‘Miaojin’ and ‘pi ma gua’ shows antiquity; patina adds interest to modern deco. 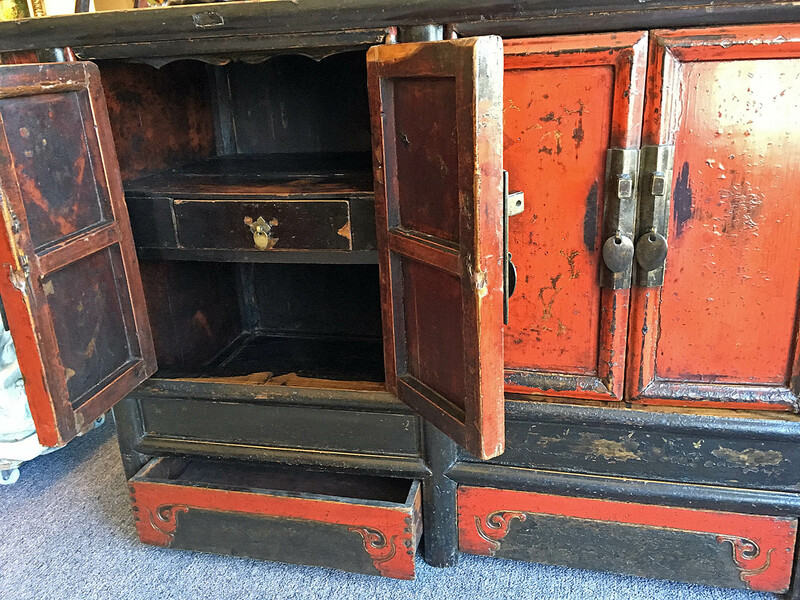 This chest has the top and the frame painted with black lacquer and a pair of recessed doors in red. The black lacquer on the top shows a slightly crackled and uneven surface. 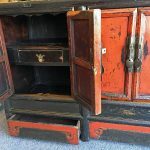 This is due to the aging of a thick base-coat, or prima, of a raw lacquer mixed with clay powder applied several times to the wood and polished before layers of refined lacquer were applied. This technique is known as ‘pi ma gua’ The technique was used to protect the wood, sealing it from outside damage. Unfortunately it does not prevent peeling and fine crackling from happening. The resulting patina, however, serves to prove the antiquity of the piece. The pair of doors had gilded paintings at one time but have faded with age, though some ‘trace-in-gold’ outlines are still visible. ‘Trace-in-gold’, or Miaolin, is a decorating technique popular during the late Ming period and was usually applied on expensive furniture. Behind each pair of doors with swivel hinges, the storage space is divided by a shelf with a small drawer. The space below the drawer extends all the way to behind two recessed horizontal black lacquered panels. These panels are set between two heavily-ridged stretcher bars. The two drawers at the bottom seem to be intentionally camouflaged as aprons as they are flushed with the side frames and stretch almost all the way to the floor. Each has a front panel decorated with a gilded low-relief trailing vine design. These drawers provide “hidden space” for valuables. Each side of the chest has a dark panel ending at the bottom with a sword-ridge molded base stretcher over a simple lacquered apron. With such elaborate styling and intensive application of lacquer on this double chest, it was most likely made for someone of the elite class.